In short, virtually all keypad entry systems - as used in various applications, including building access control, alarm system control, electronic lock safes, ATM input, etc - are susceptible to a trivial low-profile passphrase snooping scheme. This attack enables the attacker to quickly and unobtrusively recover previously entered passphrases with a high degree of success. This is in contrast to previously documented methods of keypad snooping; these methods were in general either highly intrusive - required close presence or installation of specialized hardware - or difficult to carry out and not very reliable (e.g., examining deposited fingerprints - works in low-use situations only, and does not reveal the ordering of digits). 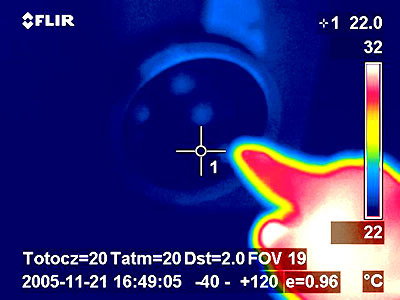 The attacker can perform the aforementioned attack by deploying an uncooled microbolometer thermal imaging (far infrared) camera within up to approximately five to ten minutes after valid keycode entry. Although this may sound outlandish, the heat transferred during split-second contact of individual keys with human body (even through, for example, gloves) is significant enough and dissipates slowly enough to make this possible after the area has been cleared of all personnel. Furthermore, since the image can be acquired from a considerable distance (1-10 meters is easy to achieve), the attacker can afford to maintain a remarkably low profile through the process. 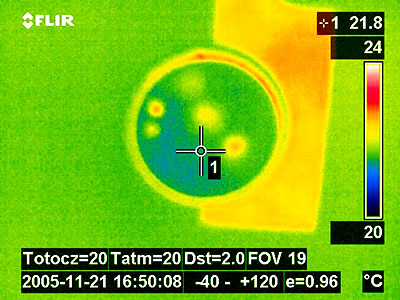 To put things in perspective, portable (handheld) thermal imaging devices, such as the one pictured above, are commercially available without major restrictions from manufacturers such as Flir or Fluke. Prices begin at $5,000 to $10,000 for brand new units, and top-of-the-line models boast a 0.05 K thermal resolution at impressively low sensor noise levels. The "return on investment" can be quite high in most illicit uses, and indeed - historically, ATM phishers were known to be willing to spend money on specialized equipment such as custom assemblies that included high-end digital cameras with wireless access. As such, the scheme is not as outlandish as it might have seemed. 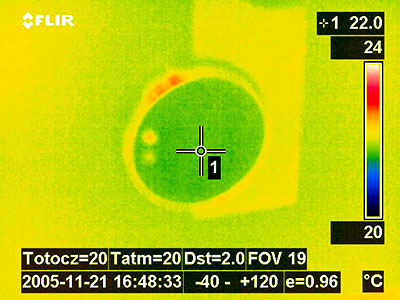 Keypad in idle state - in visible light (left) and in thermal imaging (right). Minimal ambient temperature variations are present due to different thermal characteristics of materials used in the safe. A sequence of keys is being pressed (1-5-9). The difference in colors on the right is due to IR camera automatically adjusting to relatively high temperature of human body, to avoid overexposure and blooming. Code entry complete. All pressed keys are still clearly readable in this thermogram; the sequence of digits can be infered from the relative temperature of these spots - ones with lower registered temperature (more faint color) were pressed earlier than others. There are some real-world considerations, of course: reuse of digits in a code, very rapid code entry, vastly differing keypress times, and other code entry quirks (say, victim's habit of resting his palm on the keypad) may render the attack less successful, and may make results more ambiguous. That said, it's still nifty, and apparently not limited to bad science-fiction or computer games; civilian access to sufficiently advanced technology is possible. All in all, many airports, numerous bank branches, and various other entities, might want to reconsider the effectiveness of their defenses. 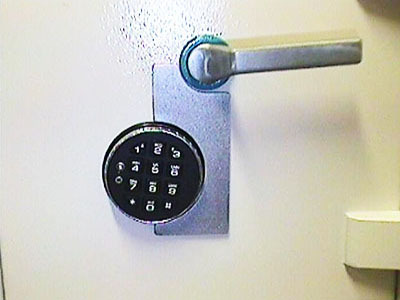 A proper defense against such techniques would be not to rely on keypad-only access control in easily accessible areas, unless additional advanced countermeasures can be implemented (well-implemented scrambling keypads originally intended to thwart fingerprint or key wear analysis, for example). Smart-card, biometric, or plain old key-based protection can be added to reduce exposure. Side thought: in terms of safe cracking, another interesting area of research is differential power analysis (DPA) of electronic locks. High-security locks on small- and medium-size safes usually have external connectors that can be used to supply emergency battery power to the device; these usually directly connect to the same route that is used to supply primary power, and as such can be used to measure power consumption characteristics and/or capture CPU-generated feedback noise, and possibly to differentiate between valid and invalid keycodes as digits are entered. If you happen to have a good 'scope lying around, give it a try. Oh - wanna buy a brick? Copyright (C) 2005 by Michal Zalewski (lcamtuf@coredump.cx) You are a visitor number 19233930.